Before we sold our house, Nathan and I loved to cook together. At night, when we would both get home from work, one would prep while the other would cook. On anniversaries or dinners, one would cook for the other. Cooking together has been a special part of our relationship. We would experiment on recipes like Smitten Kitchen’s Slow-and-Low Dry Rub Chicken that would take a full day to make. Paired with buttered dill carrots, rosemary potatoes and warm rolls, it was one of our favorite meals. Or, when we were feeling decadent and had time to plan ahead for the next morning, we loved overnight yeast waffles. That has changed a bit since we moved into our Airstream. We don’t have enough room to both work in the kitchen at the same time. Our gadgets have been reduced down to tiny home storage capabilities and weight limits. No KitchenAid Stand Mixer or Cuisinart Food Processor for us! But, we have adapted. We also tend to not cook in the oven during warmer weather because it heats up the Airstream so quickly AND we use the oven for storage. Emptying the oven out to bake has to be worth it. Like, really worth it. But, we do have some wonderful gadgets that have helped to fill in the gaps. One of those is our Dash Mini Waffle Maker. For Christmas last year, we were given a Dash Mini Waffle Maker from my mom. At first, it ended up in our maybe pile for our next trip. Then, I had bought a roll of cinnamon roll dough to bake in the oven. Oklahoma is known for its weird weather streaks. 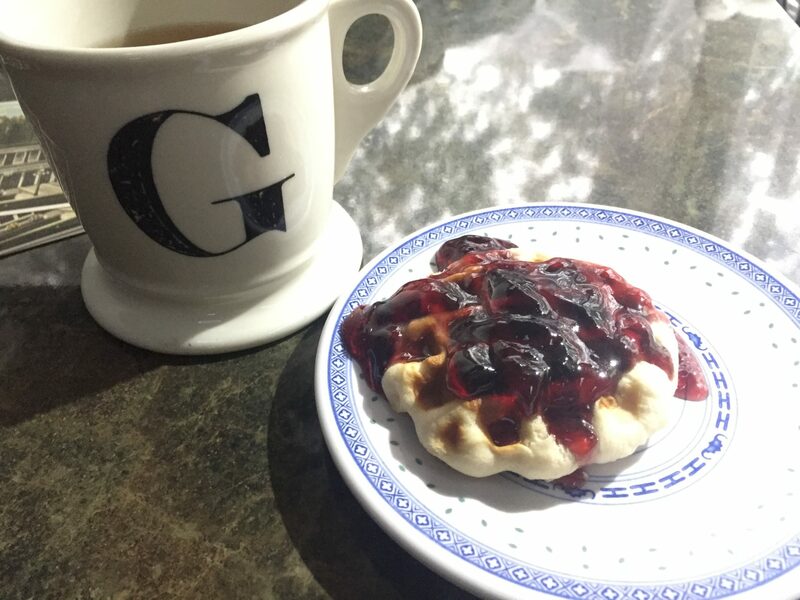 So, during a warm snap, I decided a mini waffle maker would be much cooler to use than heating up the oven. So, as an experiment I plugged it in and popped on some pre-made, generic, store-bought cinnamon roll dough. About 4 minutes later, I was gobbling up a fresh hot cinnamon roll drizzled in glaze. I started experimenting and found that we love to make biscuits in the morning. We also like to have biscuits with our lunch time salad. 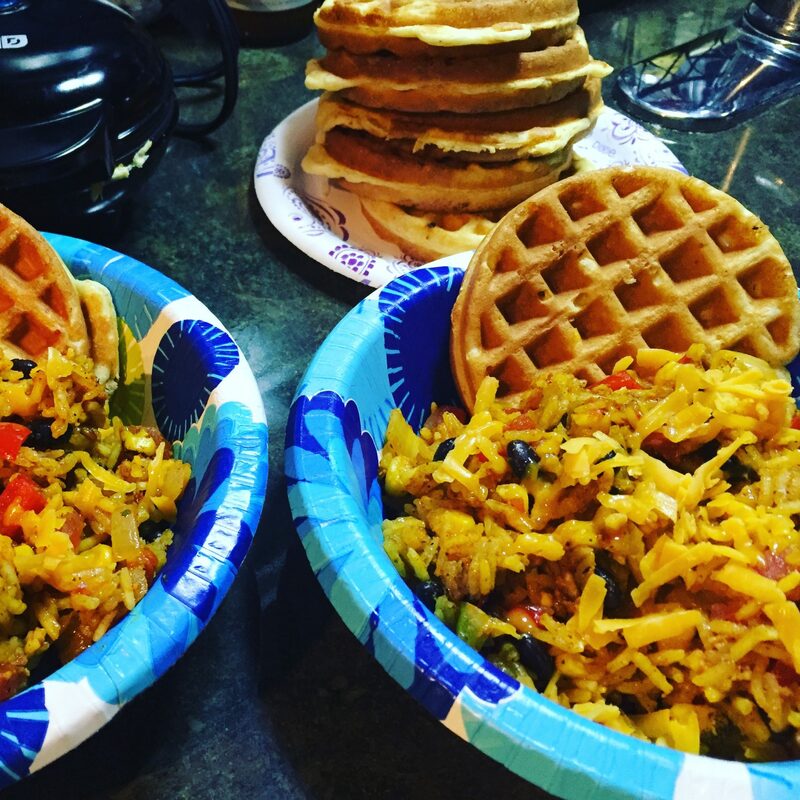 One of our favorites is to make up Spanish rice and beans or red beans and rice with cornbread waffles on the side. We have even found recipes for omelets, blueberry muffins, and brownie waffles. There are even a few cookbooks out there dedicated to the art of waffle iron cooking. We haven’t tried any of these recipes or cookbooks yet but we’ll let you know when we do! 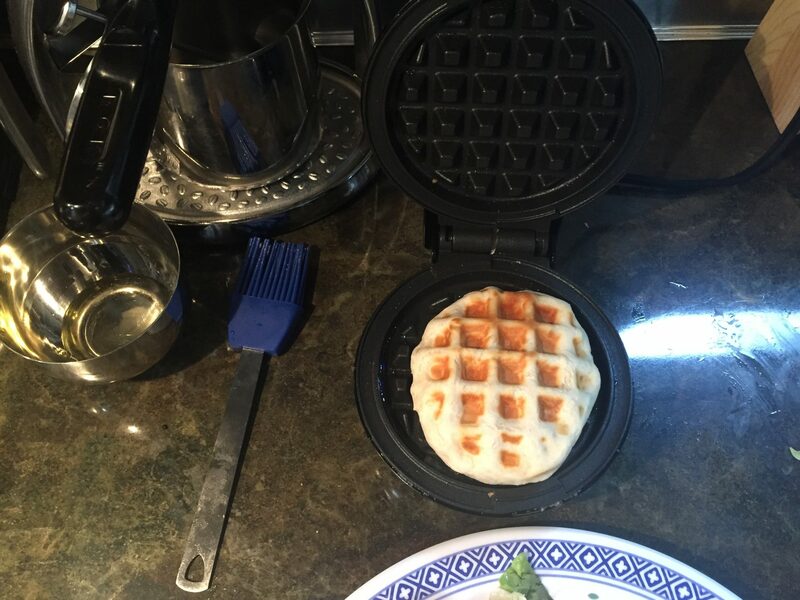 When your Mini Dash Waffle Maker is hot enough to cook, use a brush or spray to apply an oil like Avocado Oil or Vegetable Oil to lubricate the iron. Open a package of store-bought refrigerator dough or be super fancy and make your own dough. For biscuits, we find that smaller ones end up being crisper all the way around. They take about 3-4 minutes to cook. We will push the top down a little bit to help spread out the dough. But, we use the first one as a test to see if we need it to cook more or less. Then follow suit on the next few according to your crisp/done taste. Take a spoon or fork and gently lift up the biscuit and slide onto the plate. We actually prefer the wider but thinner refrigerator dough. 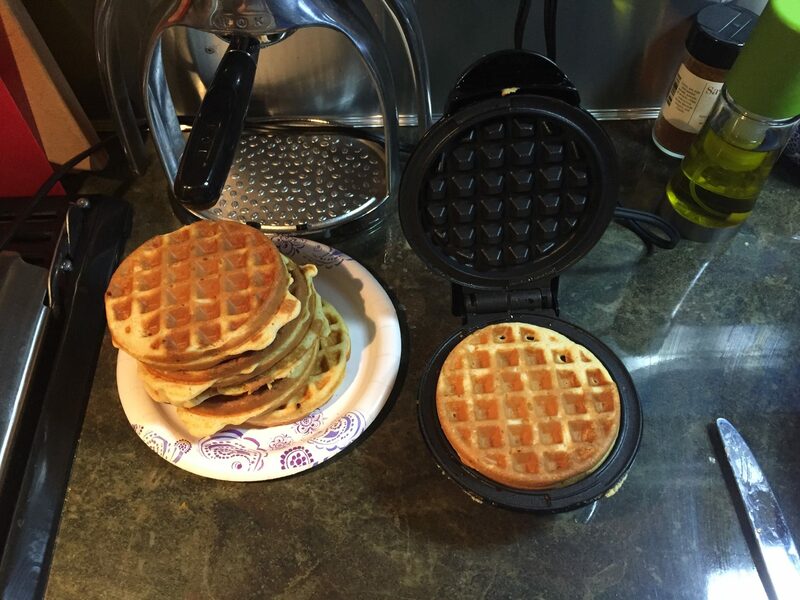 It will fill up the mini waffle maker but take a bit less time to cook. Center the cinnamon roll and push down slightly on the top. We will usually cook these for about 4 minutes but it depends on your personal taste for doneness. Mosey the done roll out of the iron and cover with icing. So good! We have used peanut butter and chocolate chip recipes but you can also buy the prepackaged, pre-made store-bough dough of your choosing. We cook them about 3-5 minutes each depending upon the recipe and altitude. Cookies are a bit trickier. You have to reach enough doneness for the dough to hold together without falling apart when you take it out hot but not fall apart. (You know how when you take out a tray of fresh cookies from the oven and you try to take one off the tray immediately and it crumbles into warm, crumbly bits.) So, make sure the dough you use is super cold and when the cookie is ready, carefully turn the waffle maker upside down over a plate while edging the cookie out with a spoon or fork. We like to improvise with a scoop of ice cream and warm cookie crumbles. Also, altitude can make any dough act weird, so if you are traveling keep that in mind. Do a test one and go from there. 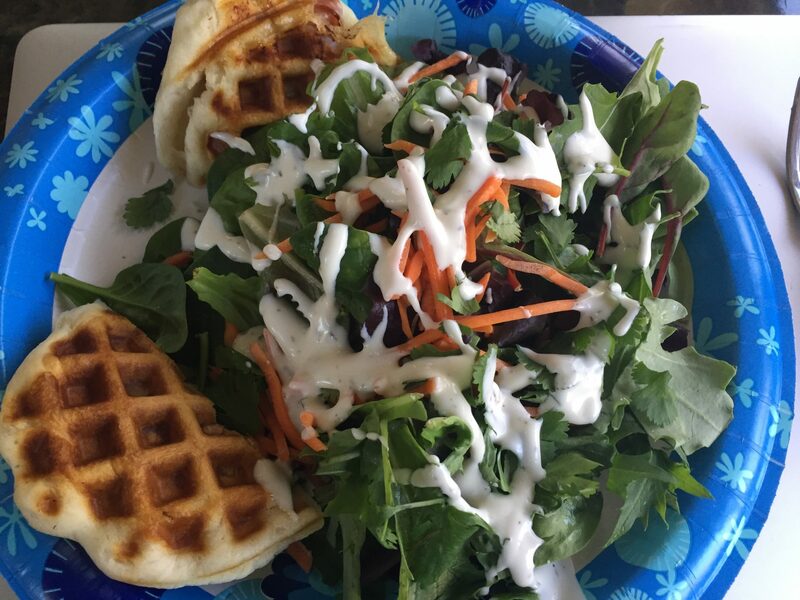 We used a dry cornbread mix and dropped them into a well-greased waffle iron. We cooked them for about 3-4 minutes each. Be sure to test out the timing on the first one. The Dash Mini Waffle Iron is a great way to limit serving sizes of treats. If there are just two of you, make only two biscuits/cinnamon rolls/cookies and wrap up the dough and refrigerate or freeze for another time. If you have a big batter, like for waffles or cornbread, go ahead and make the full batch and freeze/refrigerate the rest. We really love this versatile kitchen gadget. It is small, lightweight and has a multitude of uses. Plus, anything that helps keep our Airstream cool, is a winner in my book. Buy the Dash Mini Waffle Iron from Amazon.com here.